I’ve had good experiences with buying at Fashion Fabrics Club. The fabric I’ve bought has been good quality, the shipments fast, and the descriptions pretty accurate. One thing on the site really bothers me as a user and a front-end Web developer: their user interface design for browsing. There’s no way to filter down to specific prices or fabrics. But, I’ve found a workaround to browsing through their sales list trying to figure out if the perfect fabric is in there—modifying the URL with different categories. Hopefully this can help you as well. A quick note: this will all work at Denver Fabrics as well. They use the same store software (and are run by the same company? and have basically the exact same inventory?). If you’re on their mailing list, you get notification of their sales. I recommend this. They don’t overwhelm you with e-mails. Many of their sales (at least quarterly, if not more often) follow the same general format of their current one: a ton of fabrics marked down to a specific price. An example of a sales newsletter. 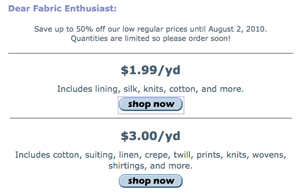 The link they provide to access these sale fabrics looks something like: http://www.fashionfabricsclub.com/catalog_items.aspx?TypID=15&FilterType=PriceEqual&FilterAmount=3.00, in this case for a sale on apparel fabrics priced at $3.00/yd. 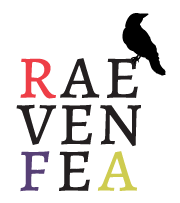 This link takes you to their site where they list 30 fabrics at a time, with no real indication of how many are on sale, and no way of further sorting. This really, really annoys me. 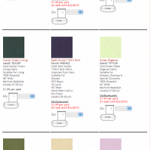 I want to be able to easily filter this selection to say, “all silks on sale for $3.00.” I don’t want to have to click through all 12 pages of 30-swatches each hoping that there is a silk hidden somewhere on the page. Especially since I’m very picky about getting a specific fiber type most of the time. Fortunately, in that mess of a hyperlink is a variable that lets you specify the type of fabric. The key is knowing what value to provide for the TypID. There are many other TypIDs available. To find other ones, navigate to that category using the links they provide and look at the url at the top of the browser. For example, the Wool: Suiting category url is http://www.fashionfabricsclub.com/catalog_items.aspx?TypId=588. Likewise, Pure Linen is http://www.fashionfabricsclub.com/catalog_items.aspx?TypId=503. This category takes you to 100% linen fabrics, while TypID=4 will filter to anything containing linen, including blends. Once you have the TypeID, you can modify the sale URL to include only fabrics in a particular category. &FilterType=PriceEqual&FilterAmount=3.00. Make sure not to remove any other parts of the URL—just change the number after TypID=. In this example link, we’re now looking for a very specific query: silk twill (TypID=568) priced less than (FilterType=PriceLessThan) the amount $10.89 (FilterAmount=5.89). Try it out. Do you have any more tips for shopping at Fashion Fabrics Club/Denver Fabrics? Is there some other way you want to filter their products? Let me know and I’ll try to come up with a solution.